The EASYSAFE by MARTOR has just received an honourable mention from the top-class expert jury in one of the most renowned international design competitions, the Red Dot Design award. Today, the red dot design award, the origins of which go back to 1955, is the largest and most renowned design competition worldwide. This award is only given to products that not only stand out due to their design but also in terms of innovation, functionality, quality, ergonomics, emotional value and self-describing use. Certified for approved safety by the TÜV, the foil and paper cutter with concealed blade enables the user to cut quickly and safely. The Easysafe features a patented cutting head design allowing for easy initiation of the cut while maintaining blade contact with the material, even on single layers of film or paper. The piercing point allows for insertion of the cutter into all types of paper, plastic or multiwall sacks. The integrated replaceable tape slitter on the head of the knife safely cuts packaging tape eliminating the need for the typical exposed blade. The unit allows for an easy blade change – no tools required! The 0.30mm blade is rectangular in shape and can be used 4 times for economy. Optionally, the cutter is capable of being locked with a special key so that blade changing can be done only by authorized personnel. “All products that have won an award in the red dot design competition had to convince an international expert jury of their quality. The products stand out from the masses with their excellent design and innovative approaches and proved their quality in one of the toughest design competitions worldwide,” explains design expert Professor Dr. Peter Zec, initiator of the red dot design award. 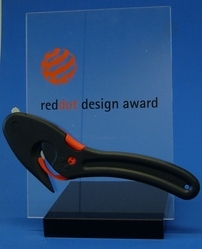 The red dot award consists of the individual disciplines “red dot award: product design”, “red dot award: communication design”, and “red dot award: design concept”. For the year 2010, the competition recorded about 12,000 entries from more than 60 nations. This year, designers and companies from 57 nations with a total of 4,252 products took part in the “red dot award: product design”. Only 198 products received an honourable mention. The festive awards presentation with more than 1,000 guests will take place in Germany in the Essen opera house, the Aalto-Theater, on 5 July 2010. Already 2009 the Easysafe has been awarded product of the year by the pro-K (pro plastics) federation in Germany and was nominated for the German national design award. The “honourable mention” now crowns this success story with an international award. Martor USA, creators of hundreds of different safety knives has been in the business of supplying tools to industry since 1981. In that year, The Spoilage Cutter Company was incorporated in Wisconsin to sell a patented safety cutter to remove the outside layers of film or paper from a roll. This tool was called the Zepher Model 102. A few years later, a larger tool for the same purpose was developed, the Zepher 105. Then, in the early 90's we started importing several safety tools from the Martor Company in Solingen, Germany for resale to our customers. Because of the increasing demand for these tools and our growing sales of these products here in the U.S., we were awarded exclusive representation status in 1995. Early in 1999, we changed the name of our company to Martor USA, Division of The Spoilage Cutter Co., Inc. due to the further expansion of our sales of this unique line of outstanding products from Martor Solingen and offers the largest variety of blade options. Press Release Attachment Easysafe Martor USA Safety Knife CatalogNEW!!! Displays the world's largest array of safety tools for cutting all types of materials including: corrugated, paper, plastic, rubber or carpeting. Products for thick or thin materials as well as foams. Also includes first aid cutters for seat belts / glass breakage, Metal Detectible Plastic (MDP) cutters, and a range of concealed blade cutters. Incorporates a blade usage chart.